Let me start by stating that I will cook this weekend! The whole reason for starting this blog was to regale you with stories of my cooking adventures. I have obviously been derelict in my duties. Inspiration has struck and I may even have two recipes to share. Normally going to an Indian restaurant is a slam dunk for me, plenty of yummy spicy vegetarian options. Wednesday night my mother and I went to Lehja at Short Pump Mall for dinner (http://www.lehja.com/) and I decided to instead try the Tandoori Prawns. 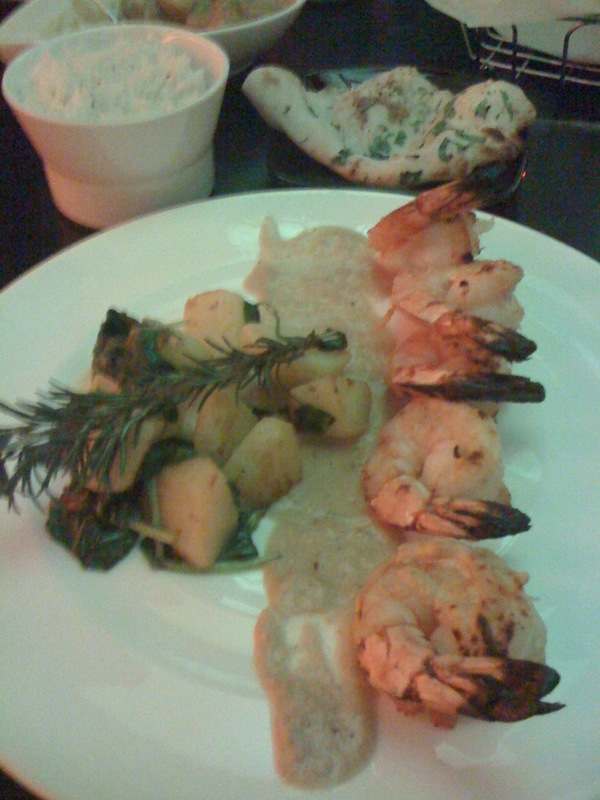 The prawns were huge and cooked well and the sauce was mildly spicy. It was accompanied by roasted Yukon gold potatoes (they were not necessary in my opinion), sautéed spinach and basmati rice. My mom had Sea Bass Niligiri Korma, which had a very “green” tasting sauce, very similar to a green curry. Of course the meal was accompanied by yummy Garlic Naan and finished off with a slice of very light coconut key lime cake. Both dishes were very good and the service was excellent. At the end of our meal we found out that the owner is the same gentleman that owns Nawab Indian Cuisine (http://www.nawabonline.com/). We had heard talk of a Nawab location opening here in Richmond, and after talking to him we discovered that Lehja is his “dream project”. Lehja has a more contemporary feel than Nawab (the Williamsburg location at least) and located in the ever popular Short Pump Mall features an outdoor fire table with seating for the warmer months. So if you are in the Short Pump area and looking to try Traditional and Contemporary Indian food you may want to try Lehja. If you find yourself in the Cary, NC area, try Udupi Cafe at 590 East Chatham Street. They serve entirely vegetarian South Indian food, including a dosa for each person at the lunch buffet. Winston-Salem Indians told my husband that they drive that far for good food. The area is called Little India and there are groceries and clothing stores nearby that are wonderful places for exploration.